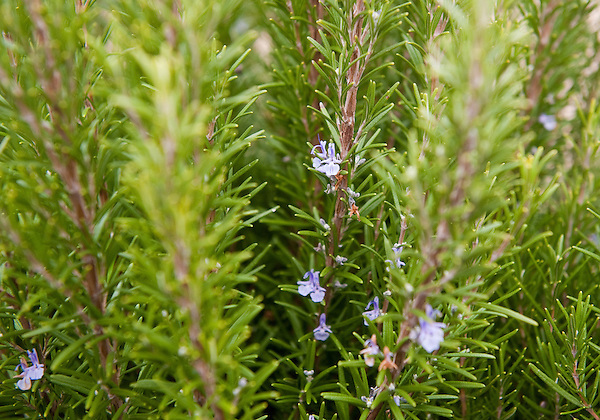 Rosemary, Rosmarinus officinalis, is a woody, perennial herb with fragrant, evergreen, needle-like leaves. It is native to the Mediterranean region. The name "rosemary" derives from the Latin name rosmarinus, which is from "dew" (ros) and "sea" (marinus), or "dew of the sea" because in many locations it needs no other water than the humidity carried by the sea breeze to live. The ingredients for two people are: 2 mackerels 1 garlic clove, 1 lemon, and 2 big fresh rosemary branches. Cut the lemon in half, thinly slice the garlic and wash the rosemary branches.Now you need to clean the mackerels: You can cut the belly such that you can remove the entrails. Wash the fish well removing all the remains of the entrails otherwise the meat could get an unpleasant sour taste. Once they have been rinsed, dry them well outside and inside so that there is no water left. Then place some garlic slices and one rosemary branch inside the mackerel’s belly cavity. Make two rectangles of aluminium foil and place the fish on one of them, squeeze the lemon juice inside and on the mackerel, then folds the foil over the fish. Lastly, bake the fish at 200 °C (390 °F) for 20-25 minutes.